Podcast #26: Little Hercules in 3D (2009) | Why Does It Exist? The myth of Hercules just like you learned in school. You know, the one where Hulk Hogan was Zeus, Socrates was an aging neurotic Jew who lived in Heaven, Satan was actually the WWF’s The Big Show and, to prove his might, Young Hercules had to win a track meet in Burbank, California. 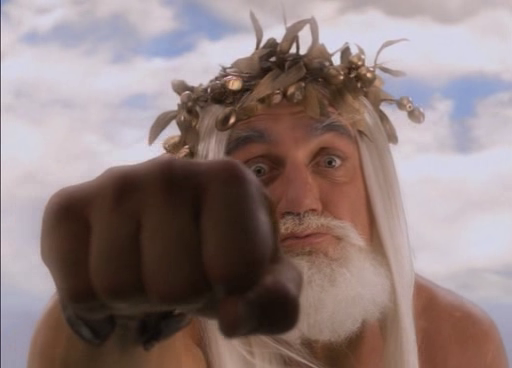 We bring you Little Hercules in 3-D, a batshit insane cross between Clash of the Titans, Chariots of Fire and… uh… Encino Man? The film stars everyone’s favorite forgotten-physically-ripped-child-that-appeared-on-the-Maury-Povich-show Richard Sandak and a random collection of people who should feel very ashamed that they had the time to devote to this nonsense. Please note that the podcast is not available in 3D. Joining us this week is actor Alex Weiner whom you may recognize from his appearances as Ricky the Pizza Guy on Blue Mountain State or in the film Territories. Watch for Alex in the upcoming feature films The Good Lie and Clyde Cynic as well as the short film Something More Than Nothing directed by none other than WDIE host Alex Rose and past guest Louis Lazaris. Music this week provided by Young Lungs – the song ‘Blood in the Streets’ can be found on the 7’’ record of the same name available here. You can also check out the video for the song here, directed by the aforementioned Louis Lazaris.